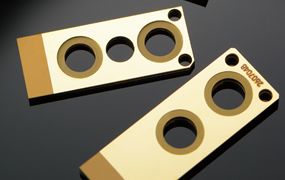 It is possible to machine cutting-resistant metals such as CuW, Kv, Ag, Mo or Cu. We are very good at microprocessing of products from a square shape of 200 μm on a side to a few millimeters. Our technologies include such processing as sharp edge, burring of less than a few μm, Ni/Au plating, AuSn vapor deposition and pattern metallization.